Light, Bright and Cheery,1 BR 1 BA, Apartment in a Quiet Residential Area. This is a monthly rental only. We have WIFI, High speed internet, computer and wireless printer, Netflix, Roku, Keurig Coffee. 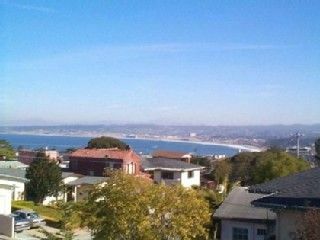 Ocean view and city lights make this a perfect hideaway in Old Monterey. The apartment is above the garages of this charming home in a quiet residential neighborhood. You can walk to downtown and to Fisherman's Wharf. This nicely furnished and fully equipped apartment is just what you need for a relaxing vacation or a writer's haven. Perfect for temporary jobs too. This home includes private enclosed garage with automatic opener, washer, and dryer. There is a large fenced yard that is private to this apartment with gas BBQ, table and chairs, chaise lounge. It is light, bright and cheery! Located in the sunbelt of Monterey. Nicely manicured yards and a charming Old Monterey neighborhood make this the perfect place to enjoy the best of Monterey. Flat screen HDTV, DVD, stereo, disposal, WIFI, washer, dryer, comfortable furnishings, bike, beach chairs, umbrella, patio furniture. Enjoy walking, boating, hiking, kayaking, swimming, sailing, whale watching, movies, theater, art galeries, antiquing, shopping and Monterey's wonderful sport center. Monterey Bay Aquarium is close by. Walk the path of history in Old Monterey. Voted Best Farmers' market every Tuesday 4-8pm. A great hideaway, above it all and a secluded. Enjoy the Monterey Bay's blue waters during the day and the lovely city lights at night. We have tried to make it perfect for your stay. Mickie Constantino Total Transitions is my company, check me out. We enjoy being in Monterey because the weather is always comfortable, there are so many things to do and wonderful great restaurants. Our family thinks this place is heaven. We have everything we need here in our home, so when we arrive we can just settle in for true enjoyment. We have put a lot of thought and care into providing you the best stay possible. Everything you need is here without clutter. Spacious bath with a large shower, glass shower doors and a large storage closet. Your own private living, better than a Bed and Breakfast. Location was excellent, view was exceptional. Thanks for staying with us. I look forward to your return. Our 6th year and can hardly wait to return next year! Hi, I look forward to seeing you next year. This place is AWESOME!!! Everything you could want or need is here - a beautiful neighborhood that's walking distance to downtown and to the beautiful forest, a gorgeous view of Monterey Bay, a beautiful residence that's modern, clean, and well cared for (including garage and private backyard). We stayed here while transitioning to our new home in Monterey and it was fabulous. The neighborhood is gorgeous and great for walking around. You might even see deer! The residence is spotless and Mickie has thought of everything. She's extremely helpful and you can tell that she takes great pride in her property. It's by far the best deal you'll find in Monterey. Thank you for choosing our home for your stay. We spent a month in Monterey in February 2018 and were very comfortable in the apartment. It offered everything we needed, and was a perfect location for us. The apartment was clean, modern, and had every amenity we could ask for. Mickie was very pleasant to work with. We have only positive comments and are looking forward to returning! Loved having you. Please come again soon. The unit is cozy and well-appointed. Thanks for staying in our home. Please come again soon. Comfortable, convenient, with an entertaining view of the bay. Tastefully decorated, with all you need to feel at home, even a garage. In the center of all the sites and attractions these coastal towns have to offer. Walking distance to downtown Monterey and Cannery Row. Cool ocean breezes through the your open windows makes for relaxing afternoons at home. Thank you for staying in our home, you are wonderful guests.